Running your first marathon is an overwhelming experience. It's all things incredible and equally painful. When I trained for my first marathon I had copious amounts of spare time and I was blissfully ignorant to what was coming my way. I ran my 26.2 six months after I started running and I trained by myself using only articles I found online and my RunKeeper app. It was the best thing that ever happened to me. It was also the most difficult thing I have ever done in my life. Before I crossed the start line I was really, really, really nervous..Training for a marathon is hard but when you finish you will feel stronger and more confident than you've ever felt in your life. 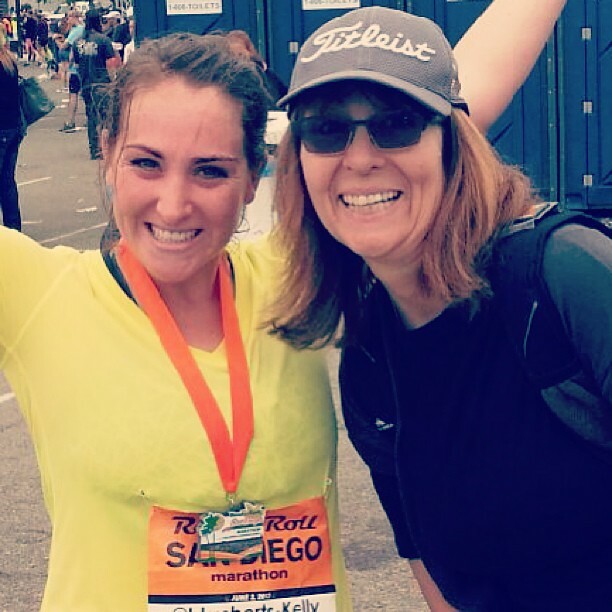 I figured today is a perfect day to share what I went through when I ran my first marathon, The Rock ‘N’ Roll San Diego Marathon back in 2013, and remind myself why I continue to do it again. Look how much fun I am having! Look at all the GU in my sports bra. Then I started to ask myself why not. I just didn’t believe I could do it. Everyone I knew started asking me if I was going to run a marathon. As in 26.2 miles! That’s two half marathons! For someone who ran her first half marathon solely on adrenaline and 2 months of training I couldn’t fathom running 26.2 miles. I started entertaining the idea but I still felt afraid to try and fail. There's a funny running shirt, "If found drag over the finish line." I literally was afraid someone would have to drag me over the finish line. But one morning I woke up, grabbed my computer, quickly entered my information and payed my entry fee before I chickened out. I had no clue what I was getting myself into. I was scared out of my mind but I was really excited. When people asked me what I was doing with my life I would tell them, “I’m training for a marathon.” I felt proud instead of embarrassed with where I was in my life. I was hell bent on putting that 26.2 sticker on my car. I didn’t know what I was doing. My long runs were all over the place. My RunKeeper app had a specific plan for me but I would pick and choose what I could fit into my schedule. I was increasing my mileage in odd increments which led to a strained ligament in my leg only a month and a half into my training. At first I thought I broke something in my foot. I had a hard time putting weight on it and I couldn’t walk without a severe limp. I made an appointment to get an x-ray and found out it was just a strain. My doctor advised me to take an entire month off but told me to try 2 weeks of cross training, icing, and elevating. Instead of running I started spinning and two weeks later I went out for a run. I experienced minimal discomfort and my doctor gave me the go ahead to continue training. He also advised me to scale back on my long runs and start them at 10 miles. I was behind on my training plan. It started freaking me out that I wouldn't end up running 20 miles at least once before the marathon so I altered my plan to include one 19 miler. Ready for some nonsense? The weeks leading into my marathon (before my taper) I ran my long runs at 11.11 miles, 9.76 miles, 13.5 miles, 13.1 miles, and then 19.34 miles. Granted I was at 15, 17 and 18 before the injury but jumping from 13 to 19 was kind of insane. Looking back, there was no reason to my madness. I have no clue what I told myself those two months before the race. About 1 mile before my break down. I was beside myself with nerves the day before the marathon. I remember walking into the San Diego Convention Center to pick up my bib thinking “What am I doing here.” I wandered around scoping out new products and listening to the speakers here and there. Then I started to psyche myself out and figured it was time to go. 1. If I needed to walk, walk. 2. Stop worrying. The work is done. Now just have fun. 3. If you end up only sleeping 3 hours the night before, that’s OK. You are nervous. You will be fine. 4. Bring salt packets like the ones they have at fast food restaurants. Take them if I started to cramp. 5. Just go one mile at a time. I felt a little better but I was still overwhelmed. I got home, ate my last carby meal, and went to bed at 8:00pm. It took me a little longer than I expected to eat and get ready because I couldn’t figure out where to keep my energy gels! I finally decided I would keep them in my sports bra. The sun wasn’t up when we left but I could see a bunch of chalk in the street and on the sidewalk. My neighbors had written good luck messages in front of our house! There were so many people reaching out to me and wishing me luck. My Dad and I got into the car and took off for Balboa Park. Nervous I was going to be late I asked my Dad to try to hurry so he floored it and RAN A RED LIGHT. It was 5 in the morning so no one was around but it was enough to make me laugh hysterically and calm some of my nerves. As we sat in the line of traffic heading into Balboa Park I remember turning to my Dad and saying, “I have no clue why I am doing this.” He goes, "Life's made for participating. Just remember to try to survive.” Very nice Dad. With that, he dropped me off and I headed for the very long Porter Potty line. I was standing behind two young women who were running the half marathon. I was eavesdropping (not that I could help it, I was right behind them) and they were talking about how miserable a marathon was! Then they went on to talk about all the horrible things that happen when you run a marathon and boy were they graphic! A little intimidated I did my business and took off for baggage check. I normally don’t mind running a race by myself but being alone in my coral was tough. I was just really nervous. I wish I had someone to share my nervous energy with. Before we took off I reached to take my first GU and realized I didn’t have any water with me! Rookie mistake. Luckily some spectators about a half mile in had little Dixie cups filled with water so I grabbed one and took my first GU. The first six miles were through downtown San Diego and it was a downhill blast. I had the biggest smile on my face. There were spectators everywhere and being able to run through Petco Park was thrilling. I took off WAY to fast and didn't really slow down until mile 7. The entire race I kept telling myself just get to the next mile. Mile 7 became mile 8 and then we hit Fiesta Island and came to mile 13. HALFWAY THERE! Cheers erupted from the runners around me and fists punched the air. About halfway through mile 13 we started to head back toward downtown San Diego. Having a visual of the finish line, 13 long miles away, stopped me dead in my tracks. It looked so incredibly far. I pulled over and tried to stop myself from crying but before I knew it I was panicking, tears were pooling, and I started to cry. A runner came up beside me and took my hand. He told me to run with him and says, “You are half way there and in a few hours you are going to be done. Every time you start to think you can’t do it, make eye contact with the people cheering and keep going.” I stopped crying and I started breathing. He released my hand and told me, “If you have to walk, walk, but don’t stop. You got this. You’ve trained so hard for this.” Then he asked me if I was ok, I told him I was and I thanked him. He told me to “Have fun” and he took off. So I started to jog and then I found my stride. Mile 13 became 14 and 15 and then 16 and 17. At mile 17 I developed some of the worst cramps I had ever had IN. MY. LIFE. You could see my calves pulsing. So I pulled to the side and tried to eat the soggy salt packets I had placed in my sports bra. People were coming up next to me asking if I was OK or patting me on the back and telling me “You got this." That is one thing I will never forget about that marathon, the people who helped me through it. Spectators are a huge part of it but the runners themselves are so supportive. They really take care of each other. The hardest part of the race was when we had to run up the 163, a freeway that goes entirely uphill for an entire mile. I thought I was going to die. So I started to walk but honestly I didn’t have it in me to run it. I was exhausted, my calves were cramping, and I still had a few miles to go. Once I got to the top I told myself no more walking. I turned my attention to finding my Mom and Dad. I had been trying to find my parents the entire way back from Fiesta Island and had no clue where they were going to be. By the time I got to the 24th mile I was nervous I missed them in the crowds. A little ways later there they were. I spotted them and a huge smile erupted from my face. I screamed, “MOM! DAD!” and started waving like a lunatic. They jumped up and down and screamed. I high-fived my Mom and they were gone. I finally see my mommy and daddy! RunKeeper was a little bit off and I had lost track of the markers. It told me I had completed 25 miles and so I took off for the finish. A mile later I passed a sign that said 25 Miles. I almost had a nervous breakdown. I had given everything I had thinking I was about to cross the finish line. The rest of the race was downhill but winded and hurting I stopped and started walked. My body was SCREAMING. My legs were stiff and I couldn't catch my breath. I just kept saying “It’s almost over. It’s almost over.” That last mile was the hardest mile of my life. You think having the finish line in sight and traveling downhill would help you fly to the end but it was a struggle. I never thought I would get there. But then I could hear the screaming and cheering so I forced myself to start jogging. And then I saw the finish line and I saw my Mom and Dad screaming and I started smiling. Then I crossed the finish line. They put the medal around my neck and I downed my chocolate milk. I tried to keep moving and stumbled towards my parents. This is me saying I am a beast. The rest of the day was painful. The rest of the week was even more painful! But every second was worth it. I've never felt so ecstatic or proud of doing something in my life. Nothing compares. Not graduating high school, not graduating college, not falling in love. I bet winning the lotto would be more exciting but a finishing a marathon is a close second. I never believed I could run a marathon. I never thought I would be brave enough to train for and run a marathon. When I put that 26.2 sticker on my car I felt like the King of the World. And now, here I am doing it again! Running the NYC Marathon is something that scares the living daylights out of me and that’s why I know I should do it. I’m helping to raise money for kids to get active and healthy (Click Here to Donate) and at the same time I am proving to myself that I can do those things I tell myself I can't do. There's nothing you can't do. Sure it’s hard being a 24 year old who lives in New York because your social life sort of disappears. It’s really hard to drag yourself out of bed at 5 in the morning to go run before a 10 hour workday. But training for a marathon only requires 4-6 months of your life. Running brings me so much joy I can't imagine my life without it. And honestly raising money and making a difference in these kids' lives makes it all worth it. So here’s to another 26.2, because I’m not just half crazy, I’m totally crazy. Until tomorrow friends, #RunSelfieRepeat.